Home Arts & Culture Columbus Day Parade 2011. The world’s largest celebration of Italian-American culture – New York’s 67th Columbus Day Parade – is on Fifth Avenue. The spirit of exploration, the struggles and triumphs of immigrants who helped build the United States, and the vibrant heritage and cultural wealth of the Italian-American community will be celebrated in New York during Columbus Celebration 2011, from Friday, October 7 through Monday, October 10. Columbus Celebration 2011 events include a black-tie Gala Dinner in the Waldorf Astoria Hotel, the traditional wreath laying at Columbus Circle, a solemn Mass celebrated by His Excellency, Archbishop Timothy M. Dolan, and the New York’s 67th Columbus Day Parade, on Fifth Avenue. Columbus Day Parade 2011 will begin Monday, October 10, at 11:30 a.m. Eastern Time, lasting until about 3:00 p.m. The annual Columbus Day Parade is the world’s largest celebration of Italian-American heritage and culture and is broadcast on six continents, and the Gala Dinner brings together leaders of the United States and Italy for an evening that pays tribute to a centuries-old bond. The parade and dinner are just two of the events that are part of New York’s Columbus Celebration, held each October. On October 12, 1929, New York City businessman and Italian immigrant Generoso Pope led a parade from East Harlem down to Columbus Circle. 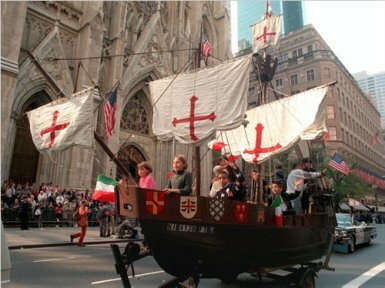 The parade celebrated Christopher Columbus’s explorations and the achievements and contributions of Italian-Americans to the landscape of New York and the United States. It was followed by a fund-raising dinner to benefit immigrants creating a new life for themselves in New York City. Through sponsorships of the Columbus Day Parade, exhibitions and Gala Dinner, the Columbus Citizens Foundation raises millions of dollars to support the education of Italian-American students who have the drive to succeed in school and beyond, but not the means to reach their potential. The annual Gala Dinner is a tradition that dates back to 1944, the year the Columbus Citizens Foundation’s predecessor organization was incorporated. On the weekend before Columbus Day, Foundation members and their guests meet in the Waldorf Astoria Grand Ballroom for an evening of friendship and entertainment that celebrates the strong bonds between Italy and the United States while raising funds for scholarships. During the evening, the Foundation pays tribute to the year’s honorees and the Grand Marshal of the Columbus Day Parade. These men and women share several characteristics: they are leaders in their chosen fields, they are deeply committed to their families, and they are grateful for the opportunities their families have received in America, as well as the Italian heritage that they hold dear. The ballroom stage has seen performances by exceptional singers from many categories of music: American Idol and pop star Katharine McPhee, opera tenor Salvatore Licitra, entertainer Joe Piscopo, and scores of other outstanding talents. Columbus Day Parade 2011 will be aired on WABC-TV New York from 12:00 p.m. to 3:00 p.m. in a live broadcast. Countries in the New World celebrate the anniversary of Christopher Columbus’ arrival in the Americas on October 12, 1492, as an official holiday. The event is celebrated as Columbus Day in the United States, as Día de la Raza in many countries in Latin America, as Discovery Day in the Bahamas, as Día de la Hispanidad and Fiesta Nacional in Spain and as Día de las Américas (Day of the Americas) in Uruguay. Columbus Day has been celebrated unofficially since the late 18th century, and officially in various areas since the early 20th century. In US, Columbus Day is celebrated annually on the second Monday of October.